, cardinal priest of the Roman church, and styled Cardinal of England, was the son of John Allen, by Jennet Lyster, sister to Thomas Lyster, of Westby, in Yorkshire, and was born at Rossal in Lancashire, in 1532. His father, according to Camden, was a gentleman of a reputable family, and had him educated at home until his fifteenth year, 1547, when he was entered of Oriel college, Oxford, and had for his tutor Morgan Philips, or Philip Morgan, a zealous Roman Catholic, and usually called the Sophister, which was a title, in the learning of those times, highly honourable. Young Alan made a rapid progress both in logic and philosophy, and was elected a fellow of his college, and took his bachelor’s degree in 1550. In the Act celebrated July 16, he went out junior of the act, having completed his degree of M. A. with the distinguished reputation of | great parts, learning, and eloquence. Of this we have a proof in his being chosen principal of St. Mary hall, in 1556, when only twenty-four years of age, and the same year he served the office of proctor. In 1558, he was made canon of York; but on the accession of queen Elizabeth, when the reformed religion was again established, although he remained for a short time at Oxford, yet, as he refused to comply with the queen’s visitors in taking the oaths, &c. his fellowship was declared void; and in 1560 he found it necessary to leave England, and retire to Louvain, then a general receptacle of the expatriated English Catholics, and where they had erected a college. Here his talents and zeal recommended him to his countrymen, who looked up to him as their supporter, while they were charmed with his personal appearance, and easy address, chastened by a dignified gravity of manners. He now began to write in support of the cause for which he had left his country; and his first piece, published in 1565, was entitled “A defence of the doctrine of Catholics, concerning Purgatory and Prayers for the Dead,” 8vo. This was intended as an answer to the celebrated bishop Jewell’s work on the same subject; and if elegance of style, and somewhat of plausibility of matter, could have prevailed, it would have served his cause very essentially; but, unluckily, of all the subjects which Jewell had handled, there was none in which he reasoned with such irresistible force. 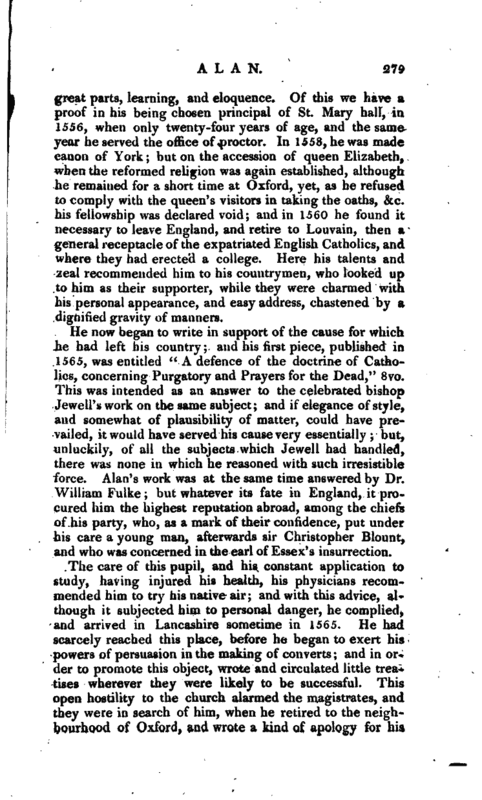 Alan’s work was at the same time answered by Dr. William Fulke; but whatever its fate in England, it procured him the highest reputation abroad, among the chiefs of his party, who, as a mark of their confidence, put under his care a young man, afterwards sir Christopher Blount, and who was concerned in the earl of Essex’s insurrection. The care of this pupil, and his constant application to study, having injured his health, his physicians recommended him to try his native air; and with this advice, although it subjected him to personal danger, he complied, and arrived in Lancashire sometime in 1565. He had scarcely reached this place, before he began to exert his powers of persuasion in the making of converts; and in order to promote this object, wrote and circulated little treatises wherever they were likely to be successful. This open hostility to the church alarmed the magistrates, and they were in search of him, when he retired to the neighbourhood of Oxford, and wrote a kind of apology for his | party, under the title of “Brief Reasons concerning the Catholic Faith.” Some, however, think that this was written at the duke of Norfolk’s house, in Norfolk, where it is certain he was for some time concealed. It appears likewise, that he returned to the neighbourhood of Oxford, and distributed his pamphlet with much boldness; and was so fearless in his zeal, that he refused a convenient opportunity of a ship going to the Netherlands. He now ventured to establish a correspondence with his old friends in the university, who were considerably numerous, and succeeded in bringing over one who had formerly been a Papist, but was now of the establishment. This so exasperated the relations of this person, that they forced Alan to fly to London, whence in 1568 he made his escape into Flanders. It has been supposed that some friends in power, who knew him formerly, connived at his easy departure. It is even said that sir Christopher Hatton bore a regard for him, in consequence of having received part of his education in St. Mary’s hall, while Alan was principal; and that Alan repaid this kindness with such honourable mention of sir Christopher abroad, as occasioned some very invidious reflections against the latter at home. Be this as it may, Alan, having arrived safely in the Netherlands, went to Mecklin, in the duchy of Brabant, where he read a divinity lecture in one of the monasteries with great applause. 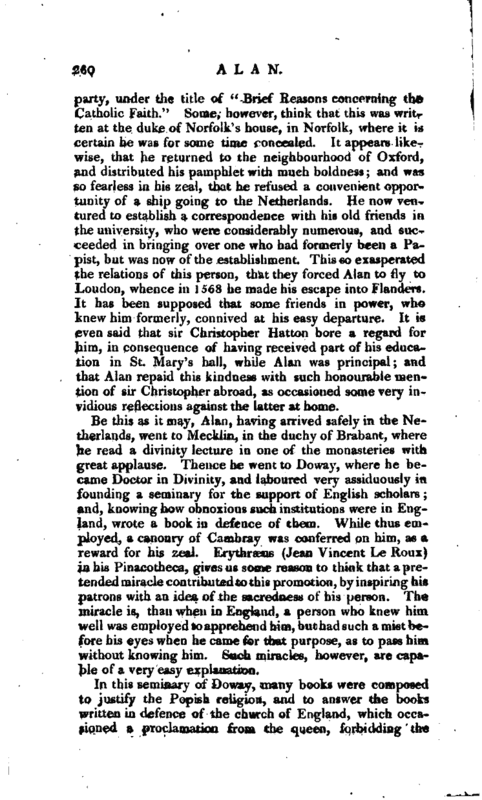 Thence he went to Doway, where he became Doctor in Divinity, and laboured very assiduously in founding a seminary for the support of English scholars; and, knowing how obnoxious such institutions were in England, wrote a book in defence of them. While thus employed, a canonry of Cambray was conferred on him, as a reward for his zeal. Erythraeus (Jean Vincent Le Roux) in his Pinacotheca, gives us some reason to think that a pretended miracle contributed to this promotion, by inspiring his patrons with an idea of the sacredness of his person. The miracle is, than when in England, a person who knew him well was employed to apprehend him, but had such a mist before his eyes when he came for that purpose, as to pass him without knowing him. Such miracles, however, are capable of a very easy explanation. In this seminary of Doway, many books were composed to justify the Popish religion, and to answer the books written in defence of the church of England, which occasioned a proclamation from the queen, forbidding the | Doway books to be either sold or read; and we shall soon see that they were not merely books of religious controversy. In 1569, Alan appointed one Bristow to be moderator of studies at Doway, the same, it is supposed, whom he gained over when in the neighbourhood of Oxford. 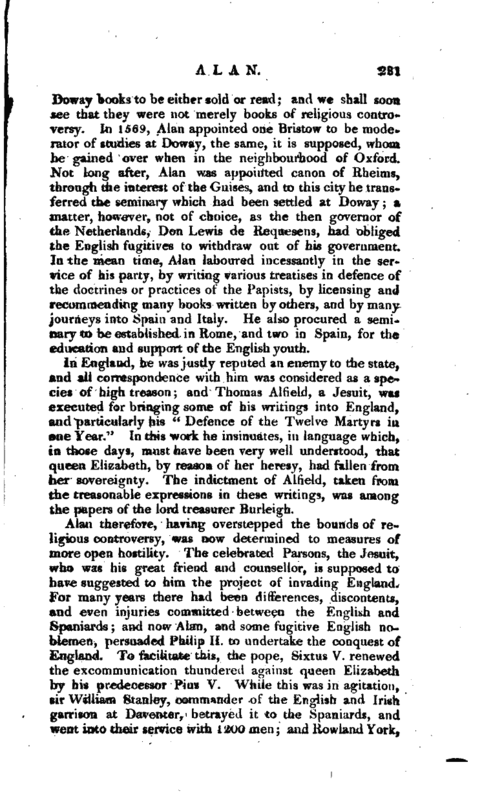 Not long after, Alan was appointed canon of Rheims, through the interest of the Guises, and to this city he transferred the seminary which had been settled at Doway; a matter, however, not of choice, as the then governor of the Netherlands, Don Lewis de Requesens, had obliged the English fugitives to withdraw out of his government. In the mean time, Alan laboured incessantly in the service of his party, by writing various treatises in defence of the doctrines or practices of the Papists, by licensing and recommending many books written by others, and by many journeys into Spain and Italy. He also procured a seminary to be established in Rome, and two in Spain, for the education and support of the English youth. 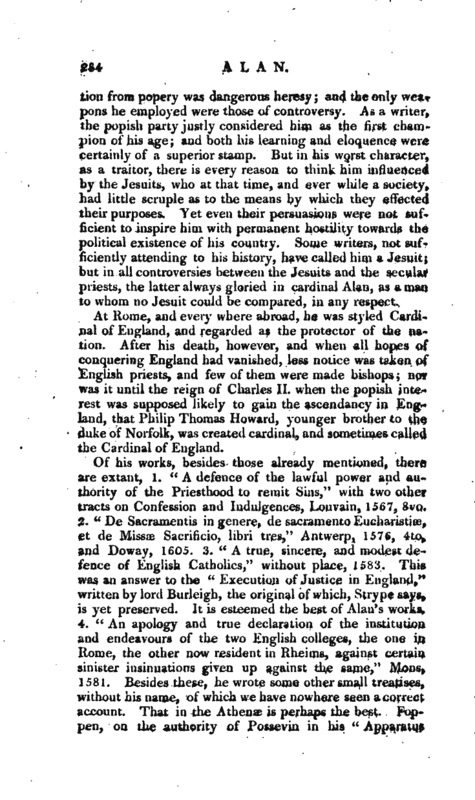 In England, he was justly reputed an enemy to the state, and all correspondence with him was considered as a species of high treason; and Thomas Alfield, ’a Jesuit, was executed for bringing some of his writings into England, and particularly his “Defence of the Twelve Martyrs in one Year.” In this work he insinuates, in language which, in those days, must have been very well understood, that queen Elizabeth, by reason of her heresy, had fallen from, her sovereignty. The indictment of Alfield, taken from the treasonable expressions in these writings, was among the papers of the lord treasurer Burleigh. Alan therefore, having overstepped the bounds of religious controversy, was now determined to measures of more open hostility. The celebrated Parsons, the Jesuit, who was his great friend and counsellor, is supposed to have suggested to him the project of invading England. For many years there had been differences, discontents, and even injuries committed between the English and Spaniards; and now Alan, and some fugitive English noblemen, persuaded Philip II. to undertake the conquest of England. To facilitate this, the pope, Sixtus V. renewed the excommunication thundered against queen Elizabeth by his predecessor Pius V. While this was in agitation, sir William Stanley, commander of the English and Irish garrison at Daventer, betrayed it to the Spaniards, and went into their service with 1200 men; and Rowland York, | who had been intrusted with a strong fort in the same country, performed the same act of treachery. Alan, no longer the conscientious controversialist, wrote a defence of this base proceeding, and sent several priests to Stanley, in order to instruct those he had drawn over to the king of Spain’s service. Alan’s defence, which appeared the year after these transactions, 1588, was first printed in English in the form of a letter, and afterwards in Latin, under the title of “Epistola de Daventrise ditione,” Cracov. 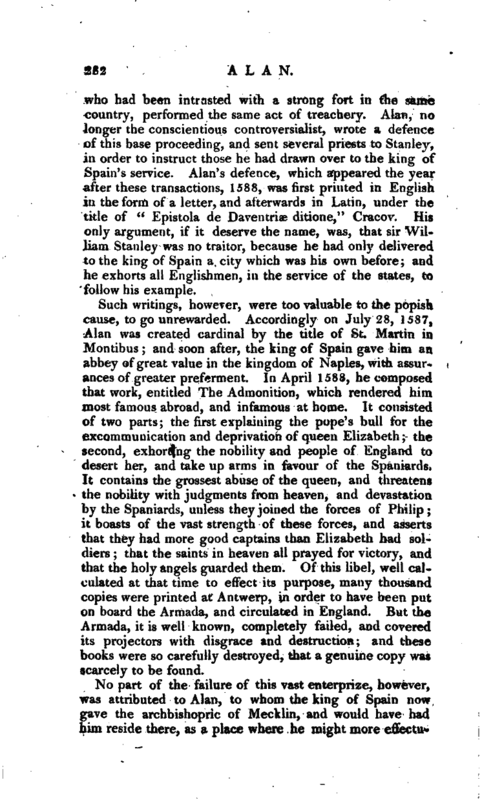 His only argument, if it deserve the name, was, that sir William Stanley was no traitor, because he had only delivered to the king of Spain a city which was his own before; and he exhorts all Englishmen, in the service of the states, to follow his example. Such writings, however, were too valuable to the popish cause, to go unrewarded. Accordingly on July 28, 1587, Alan was created cardinal by the title of St. Martin in Montibus; and soon after, the king of Spain gave him an abbey of great value in the kingdom of Naples, with assurances of greater preferment. In April 1588, he composed that work, entitled The Admonition, which rendered him most famous abroad, and infamous at home. It consisted of two parts; the first explaining the pope’s bull for the excommunication and deprivation of queen Elizabeth; the second, exhorting the nobility and people of England to desert her, and take up arms in favour of the Spaniards. It contains the grossest abuse of the queen, and threatens the nobility with judgments from heaven, and devastation by the Spaniards, unless they joined the forces of Philip; it boasts of the vast strength of these forces, and asserts that they had more good captains than Elizabeth had soldiers; that the saints in heaven all prayed for victory, and that the holy angels guarded them. Of this libel, well calculated at that time to effect its purpose, many thousand copies were printed at Antwerp, in order to have been put on board the Armada, and circulated in England. But the Armada, it is well known, completely failed, and covered its projectors with disgrace and destruction; and these books were so carefully destroyed, that a genuine copy waa scarcely to be found. 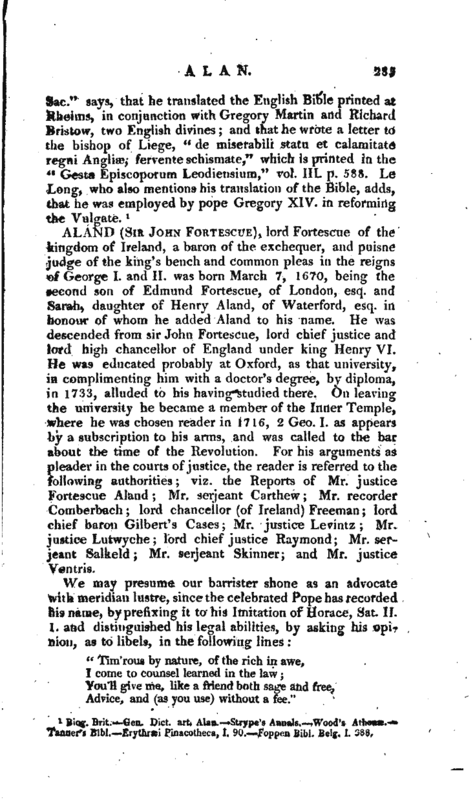 No part of the failure of this vast enterprize, however, was attributed to Alan, to whom the king of Spain now gave the archbishopric of Mecklin, and would have had reside there, as a place where he might more | effectually promote the popish and Spanish interests in England; but the pope had too high an opinion of his merit to suffer him to leave Rome, where, therefore, he continued to labour in the service of his countrymen, and in promoting the Catholic faith. Some have asserted, that he and sir Francis Inglefield assisted Parsons, the Jesuit, in composing-his treasonable work concerning the succession, which he published under the name of Doleman, in 1593, and which was reckoned of such dangerous consequence, that it was made capital by law for any person to have it in his custody. Others, however, maintain that he had no hand in it, and that he even objected to it, because of its tendency to promote those dissentions which had for so many years distracted his native country; and this last opinion is probable, if what we have been told be true, that towards the close of his life he had changed his sentiments, as to government, and professed his sorrow for the pains he had taken in promoting the invasion of England. 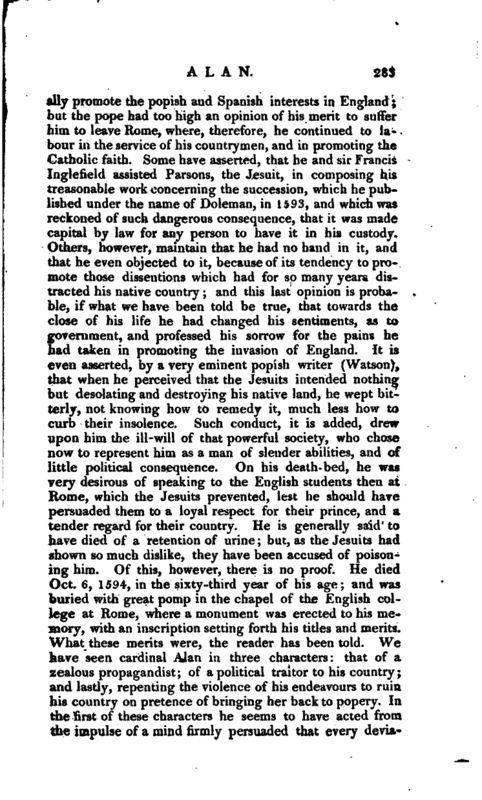 It is even asserted, by a very eminent popish writer (Watson), that when he perceived that the Jesuits intended nothing but desolating and destroying his native land, he wept bitterly, not knowing how to remedy it, much less how to curb their insolence. Such conduct, it is added, drew upon him the ill-will of that powerful society, who chose now to represent him as a man of slender abilities, and of little political consequence. On his death-bed, he was very desirous of speaking to the English students then at Rome, which the Jesuits prevented, lest he should have persuaded them to a loyal respect for their prince, and a tender regard for their country. He is generally said to have died of a retention of urine; but, as the Jesuits had shown so much dislike, they have been accused of poisoning him. Of this, however, there is no proof. He died Oct. 6, 1594, in the sixty-third year of his age; and was buried with great pomp in the chapel of the English college at Rome, where a monument was erected to his memory, with an inscription setting forth his titles and merits. What these merits were, the reader has been told. We have seen cardinal Alan in three characters: that of a zealous propagandist; of apolitical traitor to his country; and lastly, repenting the violence of his endeavours to ruin his country on pretence of bringing her back to popery. In the first of these characters he seems to have acted from the impulse of a mind firmly persuaded that every | deviation from popery was dangerous heresy; and the only weapons he employed were those of controversy. As a writer, the popish party justly considered him as the first champion of his age; and both his learning and eloquence were certainly of a superior stamp. But in his worst character, as a traitor, there is every reason to think him influenced by the Jesuits, who at that time, and ever while a society, had little scruple as to the means by which they effected their purposes. Yet even their persuasions were not sufficient to inspire him with permanent hostility towards the political existence of his country. Some writers, not sufficiently attending to his history, have called him a Jesuit; but in all controversies between the Jesuits and the secular priests, the latter always gloried in cardinal Alan, as a man to whom no Jesuit could be compared, in any respect. At Rome, and every where abroad, he was styled Cardinal of England, and regarded as the protector of the nation. After his death, however, and when all hopes of conquering England had vanished, less notice was taken of English priests, and few of them were made bishops; nor was it until the reign of Charles II. when the popish interest was supposed likely to gain the ascendancy in England, that Philip Thomas Howard, younger brother to the Duke of Norfolk, was created cardinal, and sometimes called the Cardinal of England. Biog. Brit.—Gen. Dict. art. 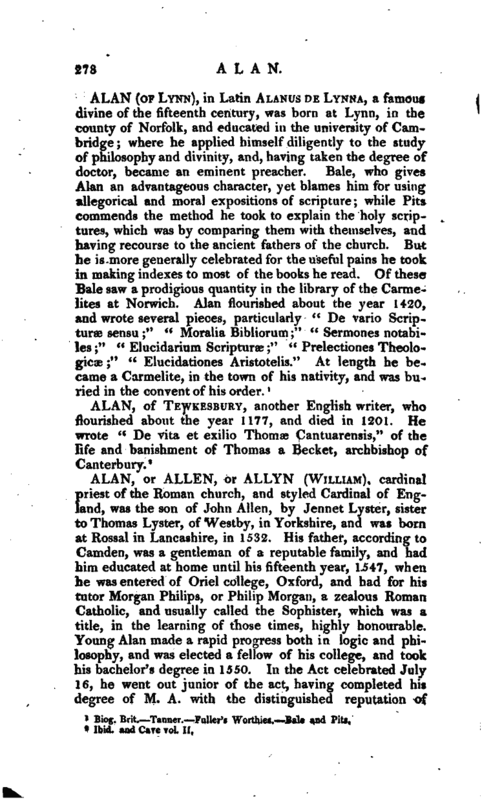 Alan.—Strype’s Annals.—Wood’s Athenæ.— Tanner’s Bibl.—Erythræ Pinacotheca, I. 90.—Foppen Bibl. Belg. I. 383.